There's no time to buy scratch cards or even a cheeky G&T on this flight - because it takes just two minutes to reach your destination. 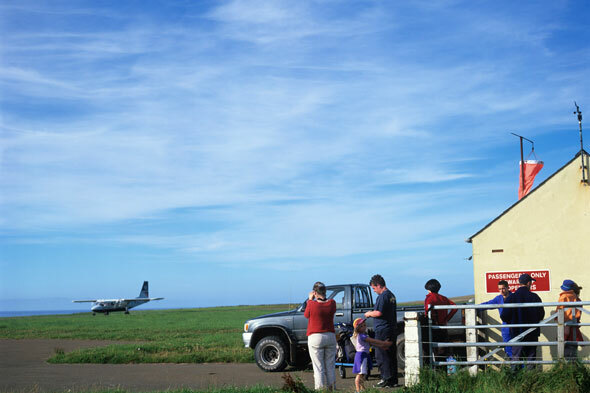 The journey between Westray to Papa Westray in the northern Orkney Islands covers just 3km and costs a mere £17 single (£21 for a day return). Passengers are encouraged to stay over on the isle of Papa Westray overnight, with reduced Loganair return fares of £14.50 if you sleep over. And we reckon it's certainly worth a stop. 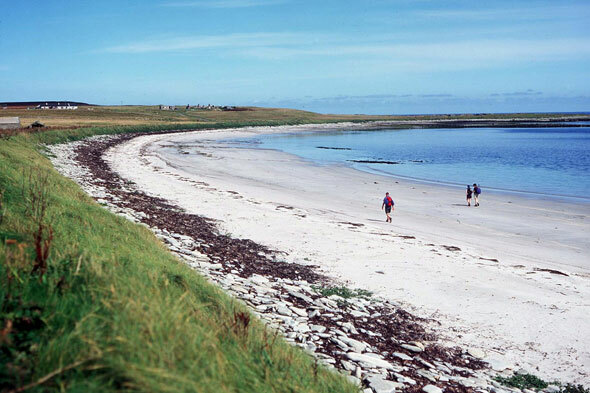 Highlights for visitors to Papa Westray include the Knap of Howar (which is older than the Pyramids), a lively RSPB reserve, wild beaches and and best of all, lots of uninterrupted peace and quiet. Ever been to the Orkney islands? Is it worth taking such a short flight? Let us know below! Sardinia is hardly short of beautiful beaches - but if you want one that has white sand, crystal clear waters and is crowd-free, then Punta Molentis in Villasimius is the place for you. The hidden beach doesn't get overrun with visitors (in part because there are no beach facilities attracting them) so it's perfect if you like privacy on the beach. Rocks of up to 15 metres surround the beach and there's plenty of greenery to add to the beautiful scenery. With 199 kilometres of coastline in Trang, you won't need to share your favoured beach spot with anyone - not least because it's one of the least visited provinces in Thailand. The beaches are breathtaking and there's a string of offshore islands for you to explore if you manage to peel yourself away from the picture-perfect mainland. Beach bums should visit the Mu Koh Petra National Park where there are idyllic islands and crystal clear waters to enjoy. Almeria is, inexplicably, a part of Spain that is still relatively undiscovered, with wild and deserted beaches in the San Jose area. Los Genoveses Beach offers shallow water and rocky headlands, while Monsul Beach is surrounded by lumps of volcanic rock. It is said to be one of the best beaches in Spain. Just a 15-minute flight from Madeira's main island lies the gorgeous Porto Santo. The beauty of the tiny island is that it hasn't succumbed to mass tourism and although its pristine beach is the main attraction for the tourists who do visit, you won't come across crowds on the nine-kilometre stretch of golden sand. If you get bored of sunning yourself on the beach, there are spectacular diving sites as well as jet skiing, sailing and windsurfing to keep you entertained. The beaches of Tobago Cays are as idyllic as they come, with white sand and turquoise blue waters. The area is a protected national marine park made up of five uninhabited islands that are only accessible by boat. The Cays are surrounded by coral reefs and brightly-coloured fish, rays and sea turtles, which makes snorkelling a must before you relax on the pristine beaches. The gorgeous inlet beach of Roccapina is overlooked by the Lion de Roccapina rock formation and is hidden from passing tourists as it's set in a protected nature reserve and only accessible via a rocky dirt track. You won't find many beach facilities at Roccapina, but the shallow water, powder-soft sand and amazing views make it one of Corsica's loveliest beaches. There's no shortage of beaches Down Under but if you want to see a coastline that's unspoilt and hidden from the crowds, head to Jervis Bay's Murray Beach where you can enjoy sparkling waters, caves and rocks as well as some fine diving sites. Located in Booderee National Park, Murrays Beach is an undiscovered spot from Australia's usual beach crowd. Snorkelling is a must in its crystal clear waters and you'll be astounded by the volume of fish in the protected area. Although Ramla Bay on the Maltese island of Gozo is known to locals and tourists alike, it remains pristine and peaceful. The huge curved bay is characterised by its golden, reddish sand and the hillsides that surround it. As there isn't much development in the area, you'll only find a couple of cantinas and ice cream vans on the beach. On the eastern hillside there's the cave where Odysseus is said to have spent seven years with the temptress Calypso. Head to Sri Lanka's east coast where you'll find the unspoilt Pasikudah Beach, which is beautiful and untouched by the masses of tourists that take to Sri Lanka's other coastlines. There's just one hotel in the area, the boutique Maalu Maalu Resort, which opened in 2011 and the beach offers white sand and calm water - the perfect place to settle with a book and enjoy the tranquil surroundings. The protected Akamas Peninsula is a great place to find unspoilt nature and deserted beaches. The water here is crystal clear and marine turtles nest on the beaches. You'll also find the Baths of Aphrodite where legend has it the Greek goddess of love Aphrodite used to bathe!